"Can we please get some alcohol into my mouth?" 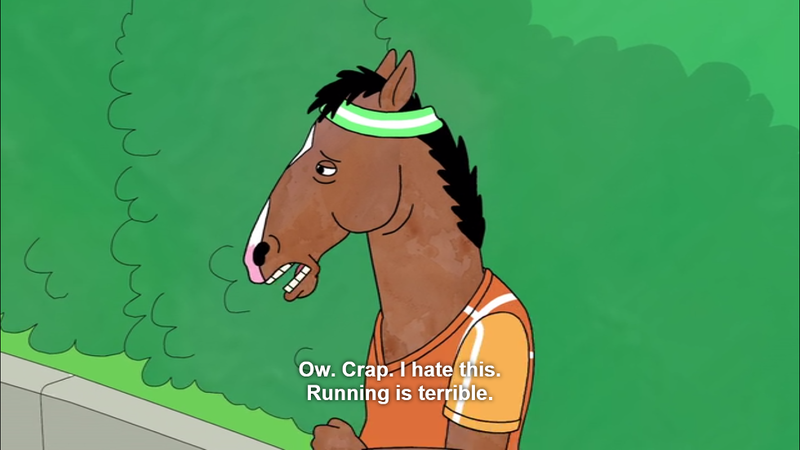 It took me a while before I finally decided to watch Bojack Horseman. I thought it looked ridiculous because I'm not a huge fan of new cartoons; however, I am SO glad I decided to watch it (binge it all in two days, actually). The existential dread in this show is probably one of the most relatable things I've ever seen. Millennial's, if you haven't watched this show yet... You need to. Without further ado, here are some times where Bojack Horseman was basically a college student. Seriously, I wish I could not care and party instead of study... But I actually would like to pass finals. Enjoy living in your world of bliss while I'm over here binge-studying all night. Let's just say every college kid has had one of these crises before. Responsibilities? What is that? Help me. What is it about college kids and binge eating? 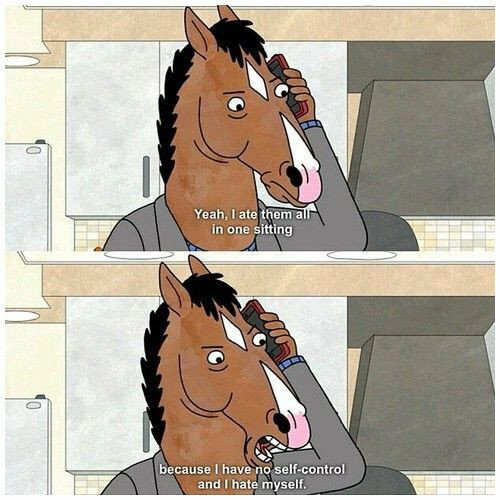 I don't know the answer but I can tell you I eat a whole pizza in one sitting about once a week and feel all the feels that Bojack expresses. Why did anyone ever decide that running was a good idea? As someone who cries pretty much every day, let me tell you this quote is #relatableaf. But, even more so when I'm cramming for finals. Honestly, this is so me when I have to actually do something important. Let's just order a pizza and drink some beers, the responsibilities will be there tomorrow. This is any time I have to do a presentation in front of the class with PowerPoint. A great font will definitely get me that A, right? 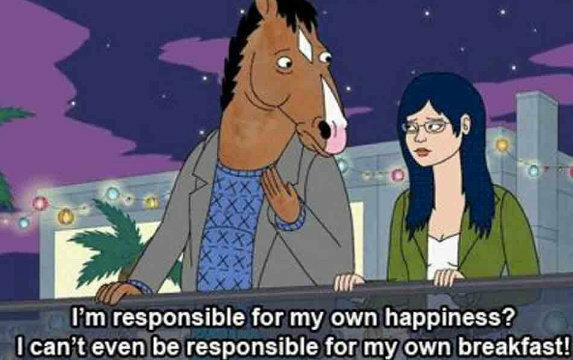 As you can see, Bojack is the poster-horse for millennial existential crises, which if you're a college student, you know far too well. As a matter of fact, if you've never watched this show, I suggest blowing off your exams to binge it all in a few days -- like I did. Happy procrastinating! I'd rather do a lot. There are two to three weeks left, the weather is (on occasion) getting warmer, and the absolute last thing that anyone wants to do is sit through class. At this point in the semester, it feels like even the most unpleasant activity is a way better alternative than going to class, and you just know that it's gonna get so much worse as finals week creeps up. When the pool opens up and it's sunny out, but yet here you are spending hours in the library studying for finals and then going, class. There are hundreds of things that I would rather do than go to class at this point in time so I will share 40 of them. They won't break promises, they'll keep them. There is nothing like living with your BFFs in college, and there is nothing more than mozzarella sticks. I love cheese and hanging out with my best friends 24/7. I'm going into senior year of college, and I'm living with three of the best friends a gal could ask for in the rough college years. One of us who's crazy. One of us is the life of the party — one of us is a fashionista. One of us is going to make all of us hit the library. And, we're all of those at the same time! These girls love to laugh! We're always making fun of each other or cracking jokes. Even though we're always messing with each other, we can put the roasts aside and get serious when someone is having a hard time or needs a good cry. They're super tolerant for my new found love of all granola things. I hope y'all are OK with my compost bin sitting on our porch all year. 4. You can't just have one! Who wants just one roommate? We all get along and balance each other out. You gals are glamorous, gorgeous and hot! Our apartment and my life will be forever changed. My life will be happier, more lighthearted and blessed, but the state of the apartment is TBD. I'm a big cryer SO thank you ALL. I am so excited to live with all of you! We are going to be the best bunch of roommates there ever was. Cheers to Apartment H!